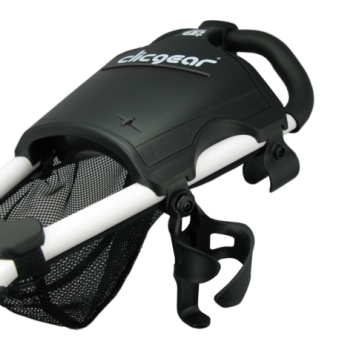 Clicgear® XL Cup Holder Plus provides extra cup or beverage storage for the course. Clicgear® XL Cup Holder Plus was introduced for 2013 and the release of the updated Clicgear Model 3.5 Plus, it allows for a greater range of larger cup or bottles sizes. This gigantic cup holder can handle bottles up to 48 fl. oz. ( 1.5 Litres ). Easily removable with the Clicgear Accessory Tab System.